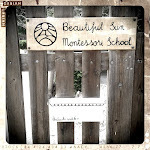 Beautiful Sun Montessori: Open Heart, I mean, house. Open Heart, I mean, house. Oh what a fun day we had yesterday at the Open House. So many friends and families graced our school with positive comments and encouraging words. We ate, drank (juice), and were merry. Best of all was to see the tiny ones, the future students, walk right into the environment and begin to work. They took out puzzles and cylinder blocks to tables and worked with them, explored some of the shelves, wrote comments in our guestbook (Thank you Cristina!). We had many experienced Montessori students of mine from prior years teaching on the island that helped and guided the new ones in putting things away after they finished and I even spied one of them (Esha!) giving a lesson to her younger sister. After months of preparing the environment, the result on this first unofficial day of school was endearing. The school looked fantastic thanks to the help of so many friends. Sayenne has done so much I can't really enumerate. Just thank profusely. Tamara claims she just likes to hang out "at that place"- it must be so, she's appeared countelss times to do basically anything that we are needing assistance with. Even covering up a window my old bedsheet, with nothing but a very heavy hammer and really untrustworthy thumbtacks. Joost made our gorgeous sign. Ronald built our sandbox and children's fence. Ken (the international liason), David, Debbie, Jennifer, Amy, Susan, Mena, thank you and thank you to the construction dudes who initially got the place into working shape. And last but not least, the Lichtenstein family that has been a rock of unshakeable support throughout this project from its very conception. Thank you thank you thank you. My heart is full of gratitude. Our new kitchen cabinet and shelves! Herb garden beginnings- we have mint, basil, thyme and oregano. Our lunch area set up for yesterday. Children automatically came into the room, sat at the picnic tables and served themselves food. It was great! Wow. This is such a beautiful classroom! I can only fantasize!